This picture sums up how much we have enjoyed living in Madagascar. Our mission in Madagascar has come to an end. Almost nine months ago we arrived our host district Tsiroanomandidy, ready for and excited about the journey we had ahead of us. Working as Youth Delegates in another Red Cross National Society and an unfamiliar context has been a challenging but rewarding experience. We have learned a lot about the Malagasy culture, the Red Cross Red Crescent Movement and about ourselves - both personally and professionally. The Red Cross youth engagement in Tsiroanomandidy has increased during our mission and we are proud to have contributed to strengthen the youth volunteers' capacity to meet the needs of the most vulnerable. We highly appreciate the cooperation we have had with all Red Cross volunteers and staff and we want to thank each and everyone who have contributed to make these past months in Madagascar and Tsiroanomandidy very memorable. Convinced that we will benefit from this experience in all of our future endeavours, we return to Norway with new skills and knowledge, good memories, new friends and motivation to continue our humanitarian engagement within the Red Cross. Finally, once again we have filmed one second every day for about a month and we now want to end this blog by sharing these moments with you. Thank you so much for being interested in our work and life as Youth Delegates in Madagascar and enjoy the movie. Celebrating the Norwegian national day, 17th of May with the youth volunteers in Tsiroanomandidy. 17th of May is Norway’s National Day and is an important day for many Norwegians. It is the day where the Norwegian people celebrate that Norway got its own constitution in 1814. Norwegian people walk in parades all over the country, wave the Norwegian flag and wear their national costumes, the “bunad”. In schools, you will find children doing fun activities all day long and it is also very common to eat hot dogs and a lot of ice cream on this day. Today, we have celebrated the Norwegian National Day together with the youth volunteers in Tsiroanomandidy. This has been a lot of fun and a great way for us to share some of the Norwegian traditions and aspects of our culture. We had team competitions where we introduced "potetløp" and "sekkeløp". The teams also competed in "blikkbokskasting" and had a quiz about Norway. We held a presentation about how we celebrate our national day in Norway and the youth volunteers got to taste Norwegian brown cheese and home made cakes. Everywhere for everyone. Showing humanity amidst inhumanity. Red Cross volunteers and staff work tirelessly to prevent and alleviate human suffering and strive to build more resilient communities in the spirit of humanity. All these contributions and achievements are celebrated worldwide on the World Red Cross Red Crescent Day, the 8th May. Together with the Tsiroanomandidy Red Cross volunteers, we took part in the celebration in the commune Ankandinondry Sakay, one hour away from Tsiroanomandidy. Through sensitisations and roleplays Red Cross volunteers promoted first aid, plague and health awareness to members of the local community. The community members also gained more knowledge about humanitarian principles and values and we once again got to experience the admirable effort of the Red Cross volunteers. who are the most vulnerable in the community and what are their needs? what kind of capacities do the youth volunteers have to possess to be able to meet those needs? which capacities do the youth volunteers need to strengthen and how can they do so? One of the main things we have worked with in Tsiroanomandidy has been to strengthen their planning skills by introducing a problem analysis tool, “the problem tree”. With “the problem tree”, you do a thorough study of one or more problems, to identify their causes and decide whether and how to tackle them. Planning workshop held by Maria and Kristina, 26.11.2016. Over the past months, we have facilitated a planning workshop for the members of the youth board and initiated to create a system of bi-monthly activity plans. Furthermore, we have focused on the importance of planning for activities that meet the needs of the most vulnerable in the community. The members of the youth board have been fast learners and we are excited to observe that they have increased their knowledge and improved their planning skills. The tools that they have become familiar with are also important for the other youth volunteers. Therefore, the district youth president held a planning workshop and introduced “the problem tree” for 12 youth volunteers earlier this week. Planning workshop held by the district youth president, 26.04.2017. During Easter, we had visitors from Norway. Together with Maria's father and Kristina's mother, we travelled and experienced the beautiful contrasts of Madagascar. It was amazing to see more of the country and we want to share some of our photos with you. Enjoy! A part of the experience of being a Youth Delegate is to learn about Red Cross programmes and activities of the host National Society. Norwegian Red Cross (NorCross) has been cooperating with Malagasy Red Cross (MRC) since 2012 and supports MRC in the areas of Disaster Risk Reduction (DRR), Health and Organisational Development. This week we got the opportunity to visit Ankadinondry Sakay, one of MRC’s six pilot communes. NorCross has supported MRC’s organizational development programme in Ankadinondry Sakay since 2013. This rural commune is located 66 kilometres east of Tsiroanomandidy, where we live. Ankadinondry Sakay has 22 villages, whereas 16 of them have Red Cross activities. These include home visits and sensitizations concerning Water Sanitation and Hygiene (WASH), environmental protection, first aid demonstrations and activities within Community Based Health and First Aid (CBHFA). There is no Red Cross youth structure established in Ankadinondry Sakay yet, but youth still make up the main bulk of active volunteers in the commune. We were fortunate to meet many of them and facilitate for some teambuilding exercises and games. Last but not least, we got a brief tour around Ankadinondry village and we learned more about the volunteers’ work. After two months of planning and preparations, the Red Cross basketball tournament in Tsiroanomandidy was finally due on Saturday 18. March. We believe that when youth have an opportunity to practice sports they are more likely to develop healthy habits. The basketball tournament was arranged to promote a healthy lifestyle and social inclusion and we therefore invited youth across the community to participate in the full day sports event. We invited two private schools, two public schools and a Red Cross team from Ankandinondry to participate in the tournament. Each team consisted of girls and boys and the players were between 15 and 25 years old. In addition to the matches, the youth volunteers had prepared other activities during the day of the tournament. The volunteers performed a first aid simulation, so that the public could watch and learn, both how basic first aid is conducted and to get to know one of the activities of Red Cross. There were also volunteers responsible for and who ran a kiosk and volunteers who shared information about the work of Red Cross and who recruited new volunteers. We had also invited a local dance group to perform several times during the day as entertainment between the matches. Prior to the basketball tournament, we promoted the event in the local community and this created public engagement. Local radio and national TV covered the event and about 300 people were present to watch the final. In other words, the tournament was a great success! About a dozen families were displaced in the district Befandriana Nord due to the cyclone. This week has been an extraordinary one. 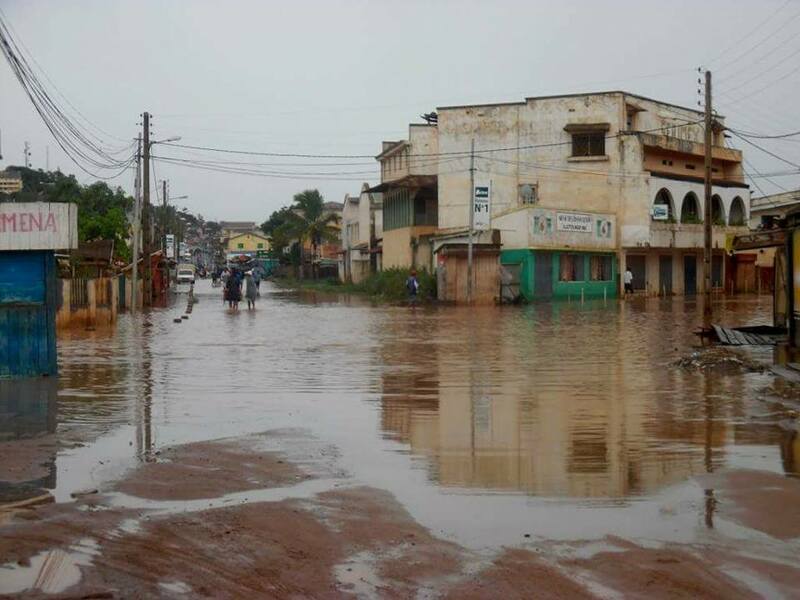 Madagascar is severely affected by the cyclone Enawo, the strongest storm to strike the island in 13 years. The cyclone made landfall in the north-east part of the country on Tuesday 7 March and moved its way southwards to Antananarivo and Tsiroanomandidy, where we live, on Wednesday evening before exiting the country into the Indian Ocean on Friday 10 March. None of us have ever experienced natural forces like the ones Enawo brought to the island. Powerful winds and torrential rain has caused major damage to infrastructure, as well as flooding and landslides across the country. Our village escaped severe consequences of the cyclone. Whenever a disaster strikes, Malagasy Red Cross (MRC) is an essential part of the government’s response. Prior to the cyclone, MRC mobilized hundreds of volunteers all over the country who sensitized populations and disseminated early warning messages. As the cyclone hit, well trained local MRC volunteers conducted assessments of the situation and provided First Aid and Psychosocial Support to the people in the affected communities. The activities have been enabled through the ECHO Emergency Fund (European Commission for Humanitarian Aid and Civil Protection) and with the financial and technical support of the Danish Red Cross, Norwegian Red Cross and German Red Cross. 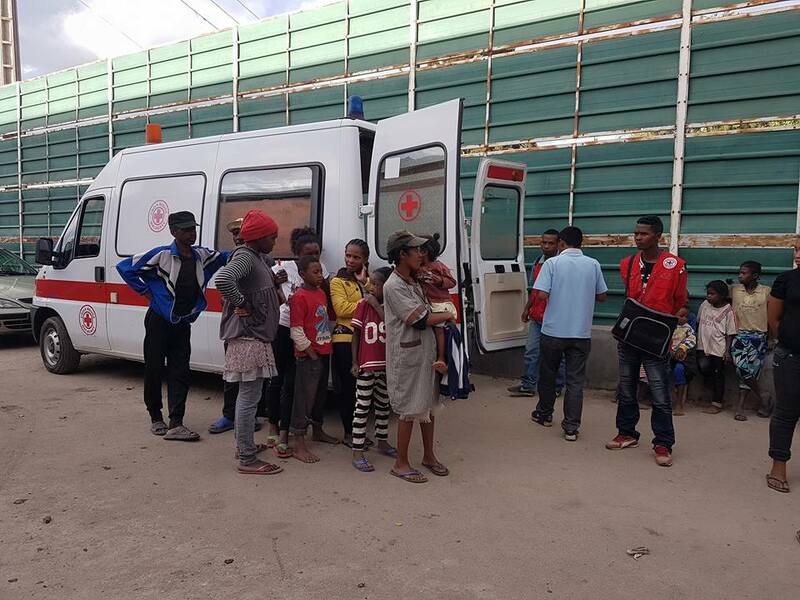 The efforts of the Malagasy Red Cross volunteers will continue as the population in many parts of the country will need assistance to restore their lives and communities both in a short-and long term perspective. MRC and the authorities fears that, under a worse-case scenario, more than 700,000 people have been directly or indirectly affected by the cyclone. Still, figures for the number of victims are not yet available for many of the municipalities and districts where the cyclone passed. However, several deaths have been reported, thousands of people have been displaced and houses have been damaged, flooded or destroyed. There is no doubt that Madagascar will need time, as well as assistance from the international community to recover from this disaster. Our thoughts and sincere condolences go to the people affected by the consequences of the cyclone. Lastly, we want to praise all the volunteers who have contributed to MRC’s rapid response and who still work hard to reduce suffering in the aftermaths of Enawo. We have been filming one second every day for about a month and we want to share these moments with you. Obviously, it is not possible to capture everything we do, feel and experience in a short video like this. However, we still hope to give you an impression of how varied, challenging and exciting it is to be a Youth Delegate in Madagascar. Enjoy the movie! To all Norwegian Red Cross volunteers between the age of 21 and 28: It is not too late to apply for the “Youth basic training course” (YBTC). This course is compulsory for anyone who wants to be a future Youth Delegate and a part of the Youth Delegate Exchange Programme. Check out this link for more information about the application process and how to apply. One of the three strategic directions for the IFRC’s work in Strategy 2020 is to promote a culture of non-violence and peace(CNV+P). Therefore, IFRC started the initiative Youth as Agents of Behavioral Change (YABC). The program seeks to empower individuals to take up an ethical leadership role in their community. The YABC learning approach utilizes games, role-plays, simulations and visualization exercises to introduce the participants to thematic issues and enabling them to develop their personal skills. By gaining this YABC experience, the youth volunteers have been given the opportunity to open their eyes to the cultural and society norms that influences each one of them. In addition, that they have started developing an ability to challenge their assumptions, change their perspectives, think in a different way and find potential solutions to violence. We have had the opportunity to travel to Ampefy, which is located between Tsiroanomandidy, where we live, and the capital Antananarivo. It has been exciting to see and experience more of Madagascar. Therefore, we want to share some pictures to show how beautiful Ampefy is. Amongst other we saw the Lily waterfalls, Analavory geysers and lake Itasy. This week we took part in an activity which is very familiar to us Norwegians - "dugnad" (Norwegian word). A “dugnad” is when several people in a community work together, on a voluntary basis and often unpaid, towards a common goal or something of importance for the community. We got to experience the malagasy "dugnad"-spirit and it was inspiring to see what community members can accomplish when working together. Deforestation in Madagascar is a great environmental threat to the island's biodiversity and it has negative impact on people's livelihoods. On Tuesday, Bongolava Red Cross volunteers and we contributed in the annual effort to protect the environment by planting trees. This activity was organized by the Ministry of the Environment, Ecology and Forestry in all 22 regions in Madagascar. In Tsiroanomandidy, the activity was led by the prefect, head of the region and the local authorities. Hundreds of representatives from all ministries in the region, major economic operators, chain shops and non-governmental organizations partook with great enthusiasm to restore the forest. After 20 minutes of solid effort we had planted 4000 (!) acacia trees. The above African proverb illustrates a core aspect of voluntary work - teamwork. Being a volunteer often means working in a team or together with other people who also wants to make a contribution. The objectives of the volunteer work might differ from one time to another, as well as the people you work with. These people are not necessarily your best friends and they might even be strangers in the beginning. Either way, to achieve a good work atmosphere, to be effective and to achieve the goals set, it is essential to create trust and build relationships within the team. This of course takes time, but it is also the ability to cooperate across gender, age and background that contributes to make a team of volunteers successful. Today we renovated the outside area in front of the Red Cross office. All youth volunteers present contributed and worked together in good spirit to restore a nice appearance. As part of today's activity we facilitated for a team building session. The youth volunteers were challenged to be effective and accurate while working together and coping with time pressure. Are YOU the next Youth Delegate? About one year ago, we both made a decision that we have yet to regret – to apply to become a Youth Delegate. Adventurous, curious as well as ready to take on new challenges, we dreamt about working for the Red Cross in a new context and new national society. Now, we are almost halfway in our mission in Madagascar and, still, we discover and learn new things about ourselves, personally and professionally, about the community we live in, Madagascar, youth engagement and the Red Cross Movement. In other words, being a Youth Delegate gives you the opportunity to work with development - in local Red Cross youth activities, with youth volunteers and of course personally. Does this sound like something for you? Then, do not miss the opportunity to apply to become the next Youth Delegate! The application process differs between the countries who are a part of the Youth Delegate Exchange Programme but in all cases, it is important to have Red Cross experience and be between the age of 21 and 28. If you are a Red Cross volunteer from Madagascar, check out this link if you are interested in becoming a Youth Delegate. Potential applicants from Norway can read more about the Youth Delegate Exchange Programme and how to apply for the position as a Youth Delegate here. The year 2016 is soon coming to an end and we are looking back at the three and a half months we have worked in Madagascar. We have had numerous new, exciting and challenging experiences and we want to share some of them with you through photos - Enjoy! Top left: All Youth Delegates 2016/2017 before departure to host Districts. Top right: View from our office in Tsiroanomandidy, Bongolava Region. Bottom left: Maria and Kristina together with the Regional Red Cross president in Bongolava. Bottom right: Maria and some of the youth volunteers relaxing after playing basketball. Top left: Celebration of Global Handwashing Day 15. October. Top right: View ofthe capital, Antananarivo. Bottom left: Youth volunteers discussing the objectives of Youth Delegate Exchange Programme. Bottom right: The Regional Red Cross coordinator talking about the number of volunteers in the region at the General Assembly. Top left: A Branch Organsational Capacity Assesment was conducted in Bongolava Region. Top right: Preparations for the recruitment drive outside the City Hall. Bottom left: View of Ambihomanga, 1 hour north of Antananarivo. Bottom right: Workshop on planning and needs assement. Top left: A ring-tailed lemur in the Lemur park, Antananarivo. Top right: The youth volunteers made "snow flakes" at the christmas workshop. Bottom left: Visiting the Queens Palace in Antananarivo. Bottom right: Non-violent communication workshop at the national volunteer camp. We will be back in January with new updates on our work and hope you will continue to read our blog in 2017. Red Cross colleagues from Italy, Norway and the Netherlands. The International Volunteer Day is held each year on 5 December and is a unique chance for all organizations and volunteers worldwide to celebrate their efforts and promote their work. Volunteers are at the heart of all Red Cross activities and Malagasy Red Cross currently have close to 14 300 volunteers who strive to improve the lives of vulnerable people within their communities. To mark the International Volunteer Day, Malagasy Red Cross organized a national camp to create a platform for exchange of experience between its volunteers. From the 3rd to the 5th of December, more than 100 volunteers from all over the country had the chance to increase their knowledge about the Red Cross and Red Crescent Movement. 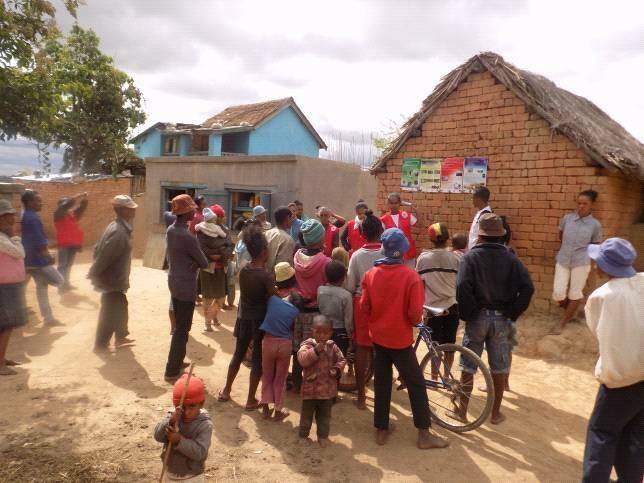 Further, the volunteers could strengthen their capacity in various fields of Malagasy Red Cross activities through workshops and interactive sessions. The camp also provided an excellent opportunity to discuss the various challenges of the humanitarian world and the areas of intervention where Red Cross National Societies work. Topics that were raised included migration, risk and disaster management and promotion of a culture of peace and non-violence. We are grateful to have had the opportunity to meet and interact with so many engaged volunteers. We are proud to be a part of an organization with volunteers committed to saving lives and changing minds. The camp was an inspiring experience for us, as well as a reminder of the rich diversity Red Cross volunteers represent. Finally, we want to thank everyone who contributed to make this year’s celebration of the International Volunteer Day a memorable event.